What’s new in GPIO Zero v1.3? One year ago today, I started the GPIO Zero project. We now have a core team of three (Dave Jones, Andrew Scheller and me). There have been 587 commits, we’ve released four major versions, and published a book. The library has great coverage of GPIO devices, and contains features I never even dreamed of. In the last year I’ve delivered workshops and given talks about it at conferences and events around the UK, the US and even in Russia. It’s being used in Raspberry Pi’s learning resources, and teacher training and by hobbyists around the world. Read on to find out what’s new in the latest release. What does this release bring? The new ButtonBoard class is a composite device representing multiple buttons. The idea being you can pass the value set from a collection of buttons into another collection of the same size: e.g. matching buttons to LEDs. You can also process the value set to get the information you want, for example the number of buttons pressed; any pressed, all pressed, proportion pressed or more. We’re currently discussion options for documenting these examples and possibly extending the features of this class in Issue #425. We’re currently discussing what else should be added to the servo classes for different use cases. Now the LEDs will light up according to the temperature: at 50 degrees all the LEDs will be off; at 90 degrees they’ll all be on; at 70 degrees half will be on; and anything in-between. There’s also a TimeOfDay class provided but it’s not working properly at the moment so I’ll cover that in the next release post. I talked about this last time. It’s really exciting. It was amazing to see this working in v1.2 but support wasn’t really very good, so its use was limited. However, significant work has gone into remote GPIO support since then and it’s going to be really powerful. Thanks to a pigpio, a C library from GitHub user joan2937, we can set up GPIO Zero devices connected to pins on Pis over a network. Easily. Here, rather than simply specifying the number 17, we’ve provided a reference to a pin on another Pi on the network. This means you can remotely control the LED connected to that other Pi. to run the IPython shell, for example. Each of these will be set up so that when you type led = LED(17), it uses pin 17 on that remote Pi. Note: you’ll need to enable Remote GPIO, start the pigpio daemon, and install the pigpio python client on your host machine. See full instructions in this gist. Of course, you can mix these methods and use a default pin factory but also specify pins on other Pis. To set this up, you need the pigpio Python library installed on the device you’re running the code, and the pigpio daemon running on the remote Pi (and remote GPIO enabled in raspi-config). Read the pins documentation for more info. Did I mention you can run this on any PC, not just on a Pi? That’s right. You can install GPIO Zero on your laptop and run GPIO Zero code which communicates with a Pi on the network. The Python code is running on your laptop, which communicates with the pigpio daemon using sockets. The daemon does all the GPIO stuff. I’ve seen this working on Linux, Mac and Windows. Admittedly, we need to provide much more solid instructions for getting this working if we want it to be seen as a viable solution for schools, Code Clubs and such. But it’s a start. Please give feedback if you’re using it (if you have any issues or not – we’d love to know). There’s also some interesting stuff around. If you know your way around installing with pip on Windows and Mac, we could use your help! See Issue #434. Then there’s temperature sensors, different types of motors, servos and more. Feature requests welcome on GitHub! We’re also aiming to establish a release schedule for future releases. Again, thanks to Dave Jones and Andrew Scheller for all their hard work in the last release, and to everyone who provided useful feedback on GitHub. Keep it coming! Dave and I will be giving a talk together on GPIO Zero at PyConUK this week. The video will be available shortly after the conference. We’re also running a sprint on GPIO Zero, welcoming new developers to the library. Come and have a go if you’re available, and we’ll show you where to start. 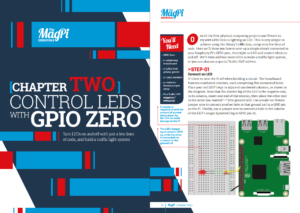 Today the MagPi team released a new publication: Simple Electronics with GPIO Zero. This 100-page book takes you from the basics, like lighting an LED, all the way to building projects like an Internet radio using the GPIO Zero Python library. 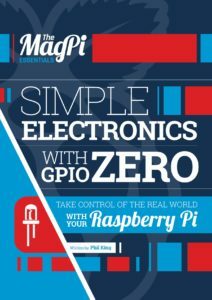 This book is available as a free PDF, but you can also pay to get it for your iPad or Android device with the MagPi app. Soon it will also be released in print. It’s now available in print. All proceeds go towards the Raspberry Pi Foundation’s education programmes. I’ve been amazed with how the GPIO Zero project has grown. There have been three major releases (a fourth due later this year), and it has been featured in The MagPi many times, and in three Kickstarter projects: the RasPiO Pro HAT; Analog Zero; and GPIO Zero Ruler. 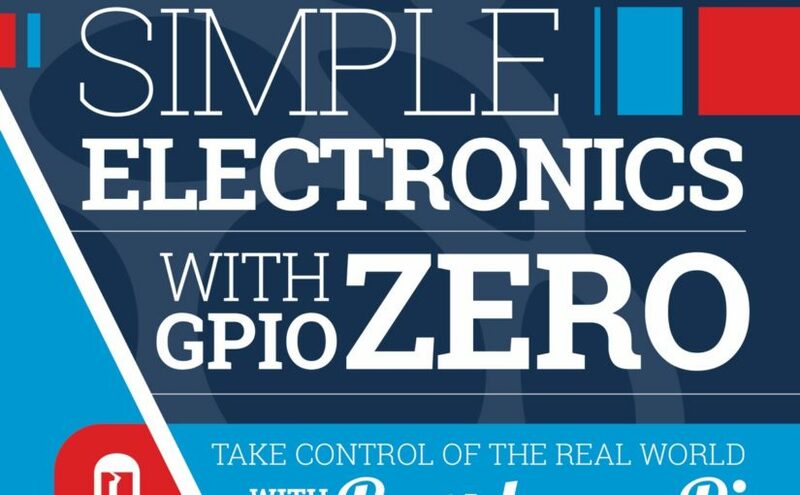 Also check out the GPIO Zero documentation, the Physical Computing with Python resource, and GPIO Zero on GitHub. 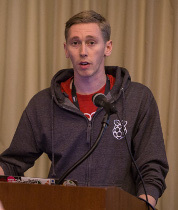 For about the last 3 years, the de-facto method of accessing physical components via the Raspberry Pi’s GPIO pins has been a Python library called RPi.GPIO, created by Ben Croston, who originally built it to control his beer brewing process. Despite its humble beginnings in a personal hobby project, it’s ended up being used in projects of all shapes and sizes by users around the world, and it has a big presence in education. In the Foundation, we’ve used it in many of our learning resources, and we use it at Picademy, our teacher training course. Physical computing is one of the most engaging activities for teaching computing, and has plenty of scope in computational thinking, programming skills and logic as well as projects being more relevant to young people (think build a robot vs. sorting arbitrary lists). These are the sorts of things a teacher would probably skip over explaining, the way they would if they were teaching the “hello world” of Java. It doesn’t matter what public static void main(String args) means, you just have to write it. While this is not an intuitive or Pythonic interface, it does allow many components to be used. Some, like LEDs, can be as simple as this. Others, like sensors, require clever manipulation of pin state reading to be useful. This makes a whole range of projects to be created, enabling users to create their application in Python, instead of having to use a lower level language. There’s a broad use of RPi.GPIO. It’s used in the Raspberry Pi Learning Resources, there are 23k code search results on github.com. In Raspbian Wheezy (Raspberry Pi optimised distro based on Debian Wheezy), root access was needed to access the GPIO pins. Users had to run Python files with sudo because the underlying code runs mmap() on /dev/mem . This meant that opening IDLE from the main menu did not allow GPIO code to be run, and IDLE had to be opened from the Terminal with sudo idle &. Since the release of Raspbian Jessie, the Pi user was given access to the GPIO pins via /dev/gpiomem, which makes a huge difference to the user experience, particularly for use in education or with beginners. I’ve been thinking for a while that there must be a way to make programming for physical computing more accessible. I gave a talk at the Cambridge Raspberry Jam in September, Build a Python API for Raspberry Pi Hardware, which included some basic code examples (wrapper classes around common RPi.GPIO code for LED, etc.) but mostly focused on packaging and distribution. The idea was to show add-on board manufacturers how to provide a Python module to go alongside their products, enabling users to make the most of it. This is something Pimoroni do very well. After presenting the talk, I wondered if my example LED class, and similar abstraction classes would be useful to others. I thought of showing teachers how they can create such classes to make things easier for their students. Teachers do often say they don’t use Python because it’s too hard – but really it’s not Python that’s hard, it’s the modules they’re using making it more complicated than it needs to be, or the poorly written code they’re sourcing from the web. The main problem with RPi.GPIO is that there’s too much boilerplate code needed to get started. The “hello world” LED program shouldn’t be 11 lines, and it shouldn’t contain anything too complex to explain to children. When you get to input devices, even simple ones like a push button, you’re forced to explain pull-up and pull-down circuits, a concept coupled with detecting falling and rising edges. I’m not saying it’s not an important concept, and that it should be taught at some point, but it shouldn’t be a barrier to entry. It just causes friction to anyone getting started. I’m talking about young people, perhaps Primary School or early Secondary, who have been programming with Scratch. The jump to Python shouldn’t be out of reach or they’ll never leave the comfort of drag-and-drop block programming. Pimoroni have some great products to accompany the Raspberry Pi (check out their range of HATs) and they do a great service to their customers by providing Python modules for each of them (created by their software developer, Phil Howard). I’ve used many of their products, and the libraries and examples provided enable you to dive straight in, start prototyping and coding up an idea. There are other great modules available, such as picamera, the Python library for the official camera module, created by Dave Jones, allowing users to easily add photo and video functionality to their Python applications. There’s also PyGame Zero, a zero boilerplate wrapper for PyGame created by Daniel Pope. If you haven’t seen it already, it’s well worth a try. Create an empty file, run it with pgzrun myfile.py and you have a game window. Add one line to change the background colour, add another couple to set the window height and width, add another and you have a playable character. It’s brilliantly simple to make a simple game and there’s no limit on where you can take it. The motivation for this was that some teachers at PyConUK 2014 said PyGame was too hard to teach with. I felt this needed doing for physical computing. It needed to be intended for teachers, children and beginners, but also be useful for hobbyists who knew their way around Python. As well as using GitHub issues for sourcing ideas feedback, I decided to also create a Google Doc to lower the barrier to entry for any teachers who wanted to contribute. Les replied, suggesting “PiZero?”. Note the timing. This was before Raspberry Pi Zero was released, but obviously I was aware it was coming. In fact, it’s part of the reason I liked the idea of adding another Zero into the mix. I couldn’t really explain why calling the library Pi Zero wasn’t a good idea, but as Dave agreed GPIO Zero was a good name, I proceeded, renamed the repo and published an initial pre-release to PyPI. My Foundation colleagues and I attended PyConUK, where we ran some workshops and sessions on the Education track, and I demonstrated it to some teachers who said it was exactly what they needed. I struggled to get any feedback other than “it’s great” – no constructive criticism, just general positivity. I also gave a physical computing talk on the main track, and mentioned by work-in-progress project GPIO Zero at the end. RPi.GPIO’s author Ben Croston happened to be sitting in the talk so I went over to ask what he thought at the end. He said he liked it and that he’d never intended RPi.GPIO to be an end-user library and expected someone else to provide a better API. I started adding interfaces to all the components I could lay my hands on. I started with the CamJam EduKits as they contain simple everyday components. Kit 1 comprises a set of LEDs, a button and a buzzer. There are worksheets that come with the kit start with flashing the LEDs and programming a traffic lights sequence. There’s scope to add the button and buzzer for different road crossings, then go on to reaction games and morse code. Input devices in RPi.GPIO are rather obtuse. 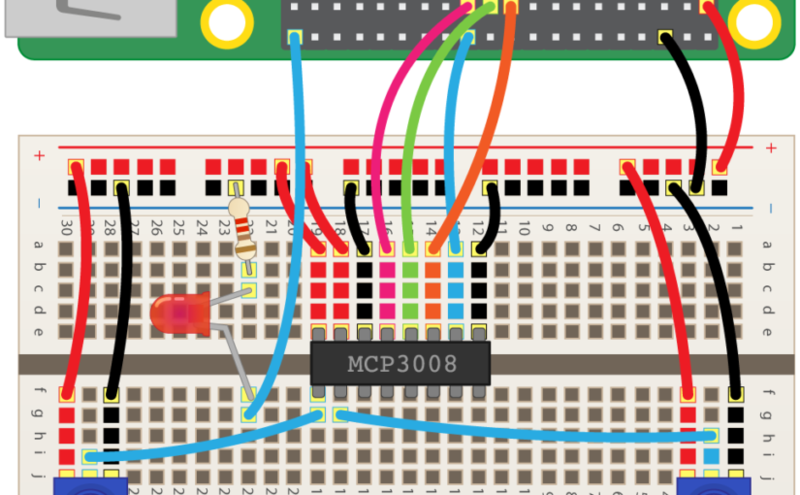 As well as configuring a pin as an input with GPIO.IN, you usually also provide a pull state: pull-up or pull-down. 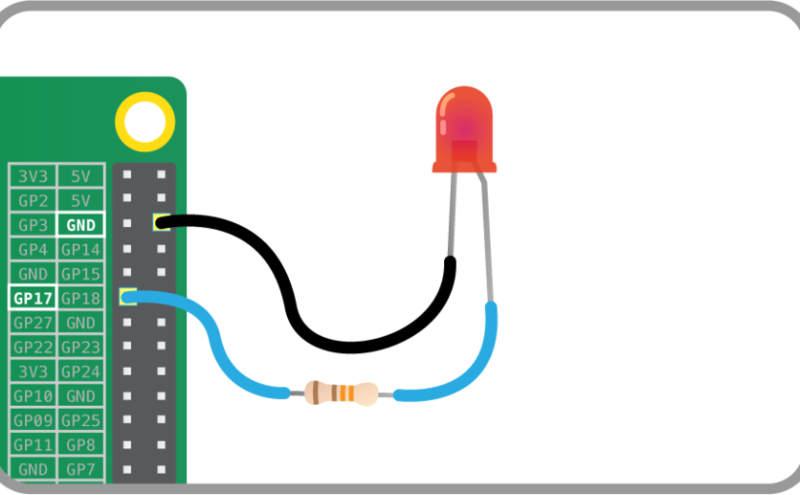 Pull-up means the circuit is wired to a GPIO pin and a ground pin, whereas pull-down means the circuit is wired to a 3V3 pin and a GPIO pin. So when a pulled-up button is not pressed, the GPIO pin state is high, and low when it is pressed. This is reversed for a button in a pull-down circuit. These two snippets of code do exactly the same thing for differently wired buttons, but require a logic shift. Alternatively, you can use if GPIO.input(4) == GPIO.LOW and if GPIO.input(4) == GPIO.HIGH but you still have the same issue. My instinct is to jump at the chance to avoid the GPIO constants and use Python’s Truth evaluator as it seems more natural. Note that the button.is_pressed code logic remains unchanged and is not coupled with the pull state. Again, there’s no need for the configuration and edge type to be coupled, so it’s abstracted away. This means whenever the button is pressed, the pressed function will be run. This example uses both the when_pressed (when_activated) and when_released (when_deactivated) properties to allow a LED to be lit when the button is pressed, and unlit when released. This code would fade the brightness of an LED from 0 to 100%. Note that this class does not need initialising with pin numbers as they’re already known. The second CamJam EduKit contains a Motion Sensor, Light Sensor and Temperature Sensor, broadening the scope for hobby projects into things like security alarms, darkness triggered lights, temperature indicator lights and such. There’s already a Python library for the one-wire temperature sensor, and initially I imported it and added a couple of aliases to make it more like the other interfaces. However, as the library developed, it became less like the others, and we decided to leave it out for the major release. We intend to bring it back in at some point in a way that will be purely compatible with other GPIO Zero component interfaces. By this time, CamJam kit 3 had been announced. I’d heard it was going to be a build-your-own-robot kit. The Raspberry Pi has no native analogue pins. However, by wiring up an ADC (analogue-to-digital converter), you can connect up a number of analogue signal channels. Note there are 8 channels on the MCP3008, and the default channel is 0. Use MCP3008(channel=n) to specify another channel. The Pi also allows multiple ADCs to be connected, so you can also provide a non-zero device number with MCP3008(device=d, channel=c). 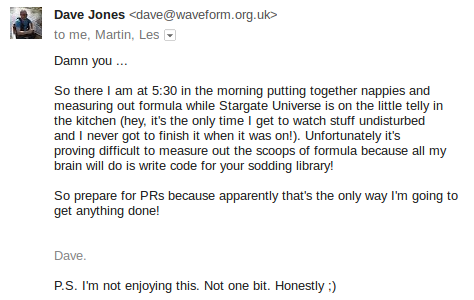 A huge thanks to Dave for his voluntary contributions to GPIO Zero, making it something really special. To Ben Croston for his excellent work on RPi.GPIO, and giving a foundation to GPIO Zero. And thanks to everyone who tested out the beta releases and made projects with it so far.